I love summer reading programs. Most bookstores offer some kind of program. 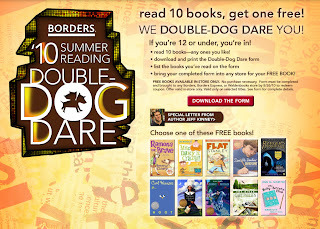 Here is the first one that I have heard about for this summer:Summer Reading Double Dog Dare program. When your child reads 10 books and then completes the downloadable form, they will receive a free book (10 titles to choose from). You do not need to buy any books from Walden Books or Borders to qualify. My thrifty idea would be to get 10 library books! The form must be taken to Borders or Walden Books by 8/26/10 to qualify. Only children 12 and under qualify for this program. Great idea! The teacher in me loves this! I saw where Barnes & Noble were doing something like this. So happy to see that Borders is doing it.